Mary Kay Pribyl’s algebra one class at EMHS is beginning their unit on inequalities. The students are comparing and contrasting solving inequalities and equations. 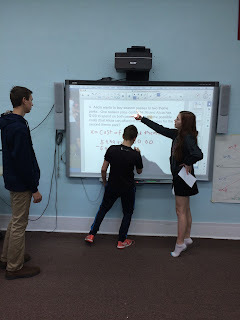 In the photo, this group is explaining how they set up an inequality to solve the problem. Shown is Clint Oldehoeft, Blake Meyer, and Natalie Staskal.